This bracelet is the first in my 'Dagger Flowers' series and was made as one piece of beadwork, simply joining the end to the start to make a bracelet which slips over your wrist. It is all beaded using just peyote stitch. 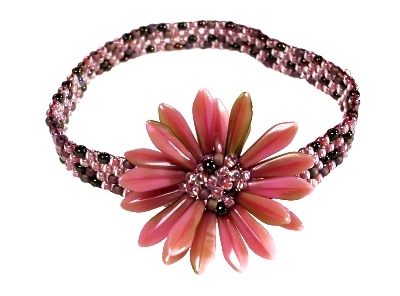 You begin with circular beading, adding dagger beads to form the petals and then switch to flat peyote for the band. You can see another example of this series here. I also developed this technique to make rings and the projects which resulted appear in the April 2006 issue of Bead and Button Magazine under the name 'Playful Petals'.